1. Ashok Kumar, Ramon Edwin Caballero, et al. "Inhibitor of apoptosis, IAP, genes play a critical role in the survival of HIV-infected macrophages." BioRxiv. 2019 February 06. 4. Jarrett Smith,Geraldine Seydoux, et al. "Liquid-like P granules require ATP hydrolysis to avoid solidification." bioRxiv,Jan. 10, 2018. 5. Melanie Villanueva, B.Sc. "Glyoxalase 1 Attenuates the Effects of Chronic Hyperglycemia on Explant-Derived Cardiac Stem Cells." University of Ottawa.Melanie Villanueva, B.Sc. Description Staurosporine is a potent inhibitor of PKC for PKCα, PKCγ and PKCη with IC50 values of 2 nM, 5 nM and 4 nM,respectively. A31 cell lines, CHO-KDR cell lines, Mo-7e cell lines and A431 cell lines. The solubility of this compound in DMSO is <10 mM. General tips for obtaining a higher concentration: Please warm the tube at 37 °C for 10 minutes and/or shake it in the ultrasonic bath for a while.Stock solution can be stored below -20°C for several months. 24 h; IC50=0.08 mM (A31 cell lines), IC50=0.30 mM (Mo-7e cell lines), IC50=1.0 mM (CHO-KDR cell lines). 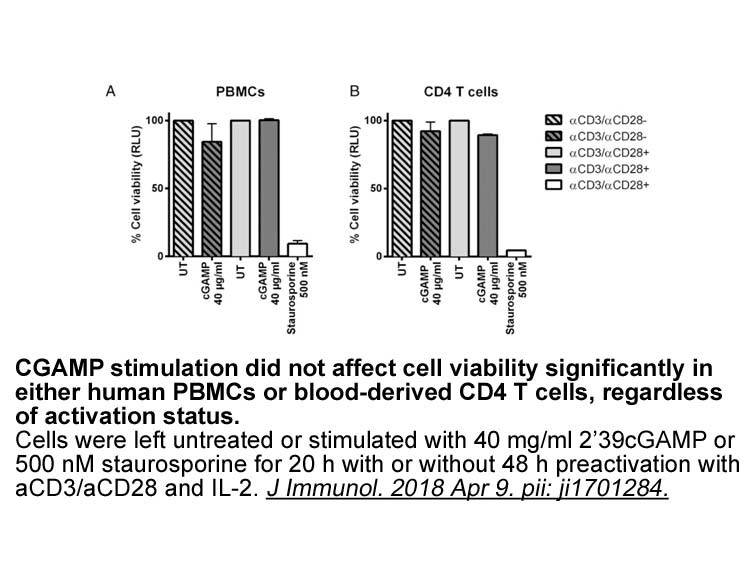 Staurosporine inhibited the ligand-induced autophosphorylation of the receptors for platelet-derived growth factor (PDGF) (IC50=0.08 mM) in A31 cell lines, stem cell factor (c-Kit, IC50=0.30 mM) in Mo-7e cell lines, and for VEGF (KDR, IC50=1.0 mM) in CHO-KDR cell lines, but did not affect the ligand-induced autophosphorylation of the receptors for insulin, IGF-I, or epidermal growth factor (EGF) in A431 cell lines. The treatment with Staurosporine (75 mg/kg/day p.o.) 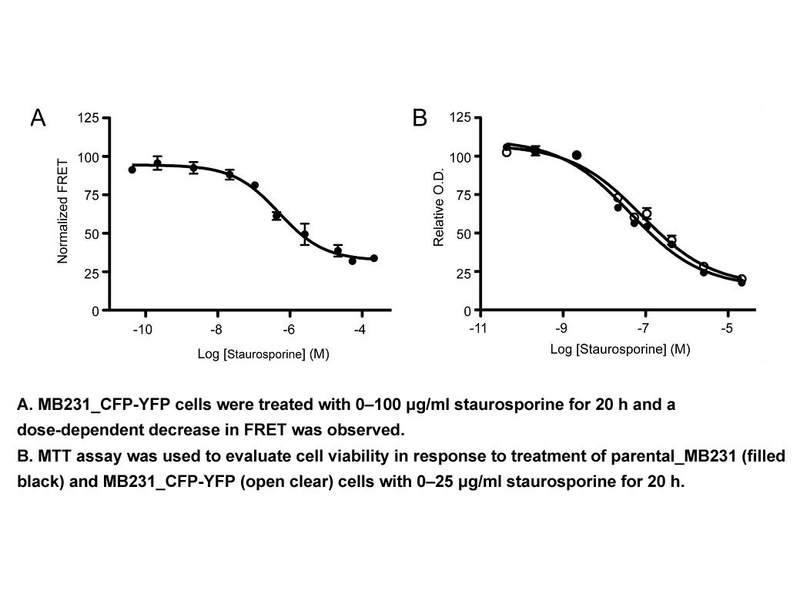 completely inhibits the angiogenic response to VEGF, but not to bFGF. 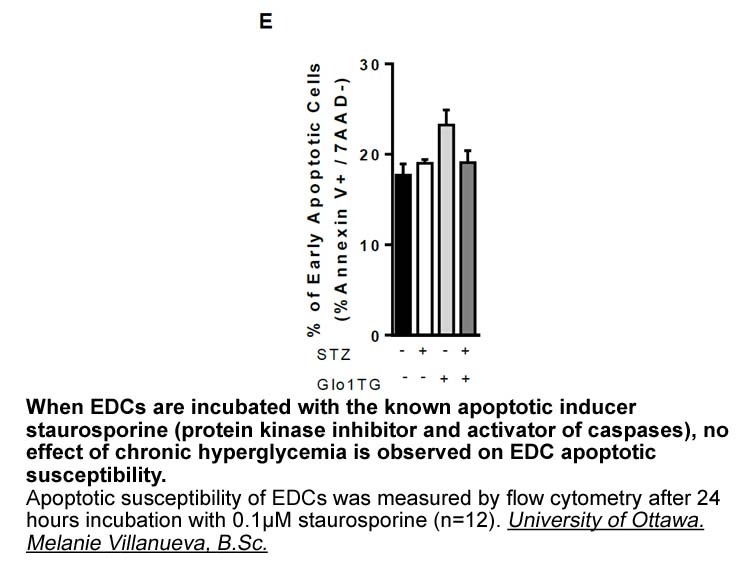 Thus, Staurosporine may suppress tumor growth by inhibiting tumor angiogenesis (via its effects on the VEGF-R tyrosine kinases) in addition to directly inhibiting tumor cell proliferation (via its effects on PKCs). 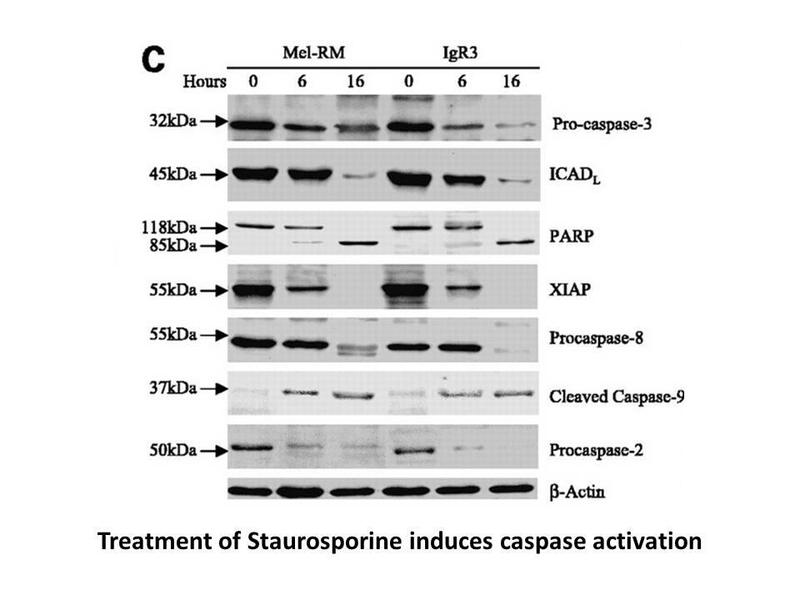 This anti-angiogenic action may contribute to the antimetastatic and broad antitumor activity displayed by Staurosporine, as well as the synergy with cytotoxic agents. Andrejauskas-Buchdunger E, Regenass U. 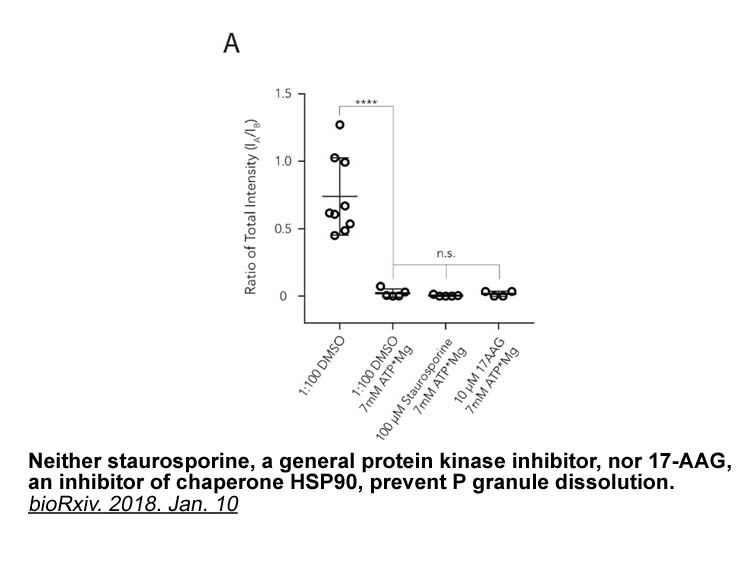 Differential inhibition of the epidermal growth factor-, platelet-derived growth factor-, and protein kinase C-mediated signal transduction pathways by the staurosporine derivative CGP 41251[J]. Cancer research, 1992, 52(19): 5353-5358. Fabbro D, Buchdunger E, Wood J, et al. Inhibitors of protein kinases: CGP 41251, a protein kinase inhibitor with potential as an anticancer agent[J]. Pharmacology & therapeutics, 1999, 82(2): 293-301. 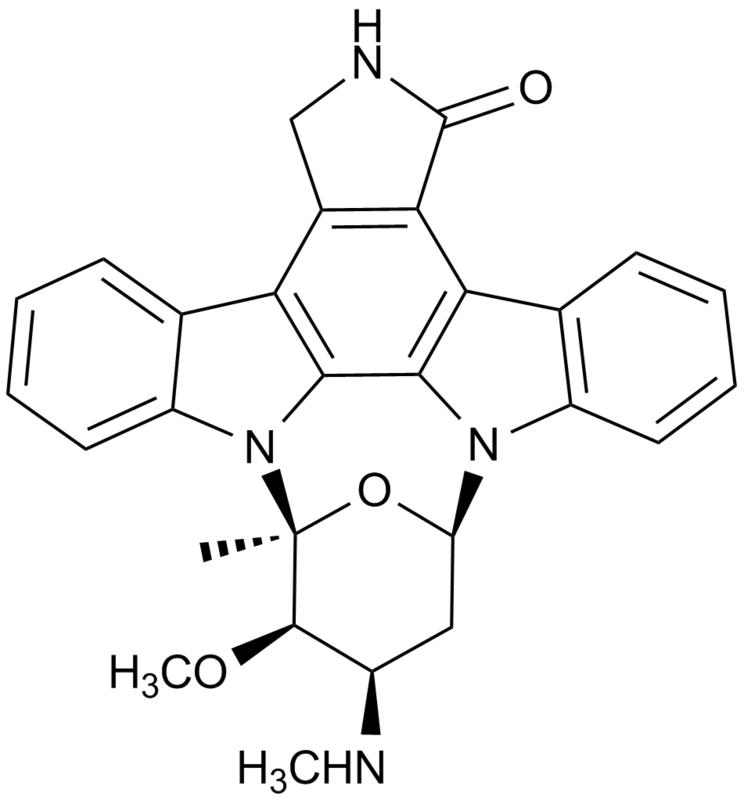 Staurosporine, an alkaloid produced in Streptomyces staurospores originally as an antifungal agent, is an inhibitor of a broad spectrum of protein kinases, including protein kinase C (PKC), Camp-dependent protein kinase (PKA), phosphorylase kinase, ribosomal protein S6 kinase, epidermal growth factor receptor (EGF-R) kinase and Ca2+/calmodulin-dependent protein kinase II (Ca/CaM PKII). The inhibition potency is strongest for PKC (IC50 = 2.7 nM) but several-fold lower for other protein kinases. 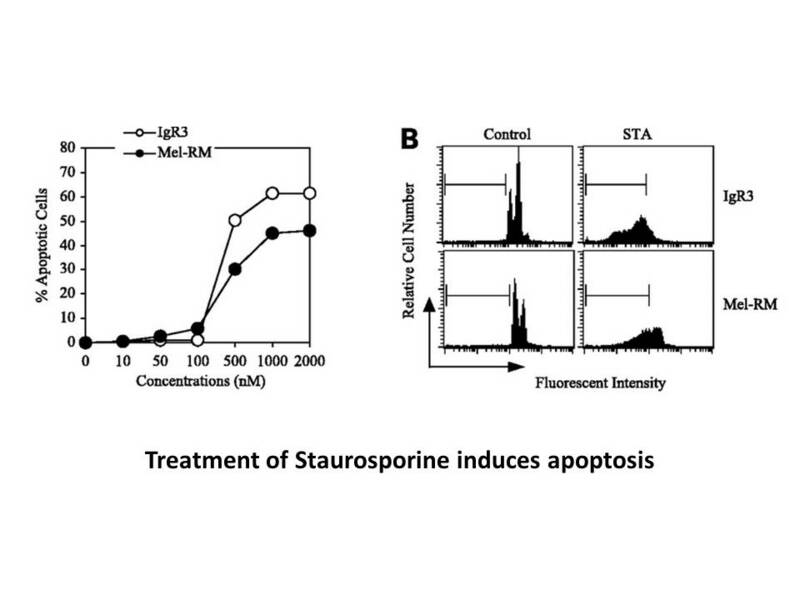 Staurosporine exhibits a strong cytotoxicity to some mammalian tumor cell lines, induces cell apoptosis, and arrests fission yeast cell elongation specifically at a stage immediately after cell division. Michelle M. Hill, Mirjana Andelkovic, Derek P. Brazil, Stefano Ferrari, Doriano Fabbro, and Brian A. Hemmings. 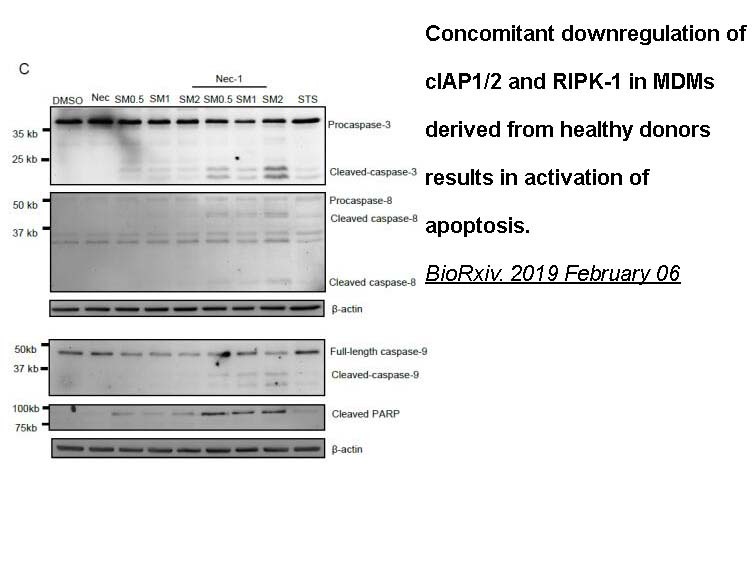 Insulin-stimulated protein kinase B phosphorylation on Ser-473 is independent of its activity and occurs through a Staurosporine-insensitive kinase. J. Biol. Chem 2001, 276: 25643-25646.